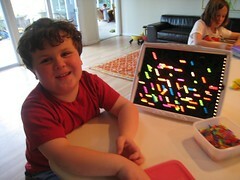 Here he is showing of his latest creation, and obviously being very proud of himself. Many thanks to the ever-thoughtful Jersey Girl, who got us this toy six years ago. We still use it All The Time.